The Wayne Shorter Quartet, a treat for our times, these troubled times, when the forward thinking ways of brilliant individuals are put on hold to justify some warped sense of making things great again. Wayne Shorter (soprano and tenor saxophone), and his long running quartet made up of Danilo Pérez (piano), John Patitucci (acoustic bass), and Brian Blade (drums), are just what is needed to make things great again. The last time I did this, back in April of 2006, at Massey Hall (Toronto), it was my first time seeing the Wayne Shorter Quartet. Has anything changed in the eleven years? We’ve all aged. As for the quartet they have aged magnificently. The songs, the confidence that comes from playing together as a group for so many years, the good vibes, whatever it is, this band is actually more energetic than I remember them. They still play timeless music, as in, time seems to stop, for me at any rate. When I wrote about that concert back in 2006, I was shocked by how quickly the concert was over. Checking my watch I realized the group had played for nearly two hours. Three compositions plus an encore song. 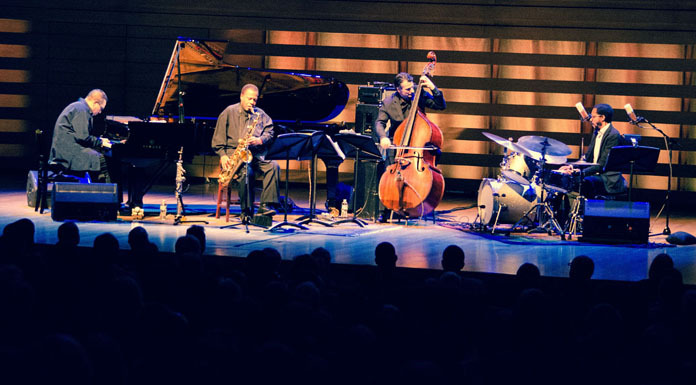 The Wayne Shorter Quartet is a group that transcends musical boundaries. On this night their music weaves and flows with undulating currents of brilliance. The passion of the art form so aptly displayed in the joyous musical conversations that the band members partake in. The bands playing seems spontaneous, the joy of creation is evident, the emotions of the musicians are as a breath of fresh air, with groans of ecstasy. Perez groaning into the piano string section. Patitucci’s leaps of joy and shouts of triumph. Or Brian Blade with his ear to ear grin and swallow like movements as he coaxes melody from his kit. The concert began and then ended as if time had stood still. Shorter and group were announced, the sold out theatre erupted in applause that went on and on, only quieted by the sounds of music emanating from the stage. Shorter sat down on a chair near to Pérez, who set up the piano on an angle, facing the drummer and bassist, yet still engaging the audience. Shorter prepared his tenor saxophone, his soprano sat at the ready on a stand to his right. A trippy intro tune had begun. Arco bass with open chords, to hush the audience, high register piano with single note runs and wind chimes care of Brian Blade with lots of space, twitchy drum patterns and a mysterious rhythm of ostinato bass, pulsating with life. From tender melodies to humorous moments with call and response between various instruments and dynamics that range from pianissimo to fortissimo, this musical masterpiece had a magical spirit. I’m not sure if this was one song or a medley of “melodies” as it flowed with uninterrupted beauty and enchantment for over half an hour. 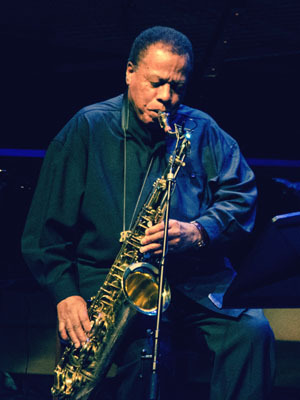 The Wayne Shorter Quartet was founded by Shorter in 2000, an acoustic band for the ages. A contemporary quartet fusing the past with the present and looking into the future to provide spontaneous creation. Shorter chose his band members for their incomparable skills and the simpatico that evidently happened on first encounter, the playing of this quartet has progressed to an intuitive level, with live performances as a take your breath away ride into the unknown. Three live albums later and going on seventeen years, the group has melded into a near supernatural force alongside Shorter’s spiritual guidance. The Quartets three live albums, Footprints Live (2002), Beyond The Sound Barrier (2005) and the most recent CD, Without A Net (2013). Wayne Shorter has a studio album, Alegria (2003) with members of his quartet along with guest artists. The band would run through four songs, plus an encore song. An hour and forty five minute concert with no breaks, the exception being a brief pause to take their bows and wave goodbye to the standing ovation that ushered them on their way. They returned to the stage in short order to play the final composition. Shorter would begin on soprano sax and the band members join in, Pérez playing off Shorter’s saxophone in counterpoint, the drums laying down the backbeat, Patitucci starts playing last as he arranges his equipment. The song develops with Shorter laying back and in his minimalist fashion producing sumptuous tones while Pérez produces waterfall runs. Patitucci and Blade are playing off each other with dynamism. And as if through some unseen communication the music stops and Blade fires one more beat – solo. The last word – the other band members get a kick out of this or so it seems. A group bow ensues, to another standing ovation. The applause goes on and on, the lights stay off. My friend and I depart, not wanting to push the maestro, we both agree he needs his rest. Wayne Shorter whose definition of jazz is “I Dare You” is in his 83rd year and has been daring with his music since the 1950s.